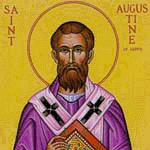 St. Augustine, born in Roman N. Africa to a devout Catholic mother and a pagan father, was a notoriously rebellious Catholic teenager who cohabitated with a girlfriend, joined an exotic Eastern cult, and ran away from his mother. Augustine became a brilliant and renowned teacher of public speaking and was appointed by the emperor to teach in Milan, Italy, at that time the administrative capital of the Western Roman Empire. While there, he happened to hear the preaching of the bishop of Milan, Ambrose, who baptized him in 386. St. Augustine ultimately renounced his secular career, put away his mistress, and became first a monk, then a priest, then the bishop of Hippo, a small town on the N. African Coast. The voluminous writings of this Early Church Father span every conceivable topic in theology, morality, philosophy, and spirituality. St. Augustine of Hippo is commonly recognized as the great teacher in the Western Church between the New Testament and St. Thomas Aquinas and is one of the Doctors of the Church. He died in AD 430. (bio by Dr. Italy). For more on Augustine's life and teaching, see When the Church Was Young: Voices of the Early Fathers by Marcellino D'Ambrosio.